The modern workforce is more dynamic and widespread. You could be in New York working for a client on the other side of the globe. There are some careers like – graphic designing, content writing, web development and even customer support and sales that can be pursued from home. In fact, work from home is a win –win situation for both the employee and the employer. While the employee does not have to spend hours in a day commuting to work, employers save on the infrastructural cost of setting up an employee in a traditional office space. In fact, soon enough, work from home is going to become a norm. Advancement in communication and technology will further facilitate this transition. Back in the day, you had to do was walk over to your co-worker’s desk if you needed to ask them a question about something. If you needed to ask somebody who was outside of the company, you would have to write them a letter, send it through the mail, and wait until you got a response from them. Nowadays, a quick reply is within reach—just the press of a button and you would have the answer you needed in a few seconds, tops. With all the many ways that we can now converse over the internet, it can be confusing to decide on just what platform to use when trying to get a message across to your boss or co-workers who are based remotely. In this article, we will try to differentiate the reasons why you may choose one communication method over another. By using an audio call, you can have a conversation that is hands-free, meaning you can still use your computer for any minor tasks you have waiting for you. However, you may have to be ready to try and control some inevitable chaos that can ensue over this type of communication. If you are working from home full-time, make sure you take important business calls from your home office rather than the living room. This would ensure that you are not distracted when communication with colleagues and business associates. According to an article on Inc., those who are part of a group audio call have a bigger chance of speaking over other people. This may be caused by the fact that there is a bit of a delay between speaking into a microphone and receiving the response of the other people in the discussion. This may also be due to the fact that there is no way for you to determine whether a person is sitting back and waiting for you to finish speaking, or is getting ready to pitch in their own two cents. The lack of visible body language largely contributes to this confusing set-up. Because you can see a person’s body language and facial expressions in an online video meeting, you will find yourself a lot more engaged with the other persons involved. A BlueJeans video conferencing solution can bring you a slew of benefits, such as the ability to start or join a meeting on any device, from home or office. That means you can still be part of a discussion whether you are using your desktop computer, your laptop, your mobile phone, or even your mobile tablet. However, you will have to be paying full attention to the discussion at hand if you want to make the most out of this type of communication method, since it will engage all of your senses, most especially your sense of sight and hearing. Video Conferencing is the best form of communication with clients for professionals who predominantly work from home. Emails are still the default method of communicating in most businesses, and for good reason. Besides replacing the need for paper snail mail in a lot of companies, they are very straightforward to use. It is the most reliable way to send update on your work, especially if you are working remotely. You can even organize your mail by filters or folders, depending on the email service that you are using for greater efficiency. Another plus is that you can set up an auto-responder in case you are not around to answer your messages, such as when you are on a business trip or off on a much deserved vacation. However, the disadvantage to email is that it is not quite as instantaneous as receiving a quick message from somebody over your chat app of choice, nor is it as smooth as a phone call, where you can immediately provide and receive feedback. Plus, it is easy to misread somebody’s tone in a message because there are no audio or visual cues to fall back on, so it is important to make them as formal as possible. You may also end up being copied into a group thread that you no longer want to be a part of and have no option of opting out without telling the others that you want to be removed from the conversation, according to an article on Future Work Centre. Have you decided which platforms you will personally be using when carrying out your task at home or office? 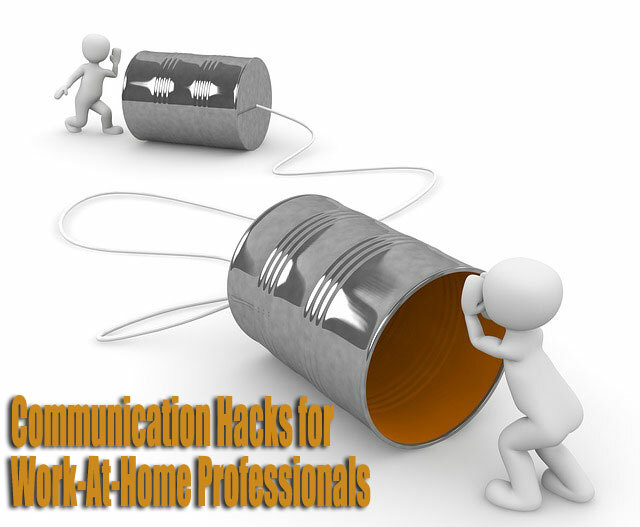 While there is no perfect solution for every situation, there are definitely pros and cons to each communication method. It will be up to your and your colleagues to decide which makes the best sense to use given any particular scenario. By keeping all of this information in mind, you should be able to avoid useless noise and conduct more useful conversations instead. It is incremental at improving productivity, and those who have made the conscious decision to pursue their career from home have to be extremely mindful of the methods they rely upon to connect with clients and employers.